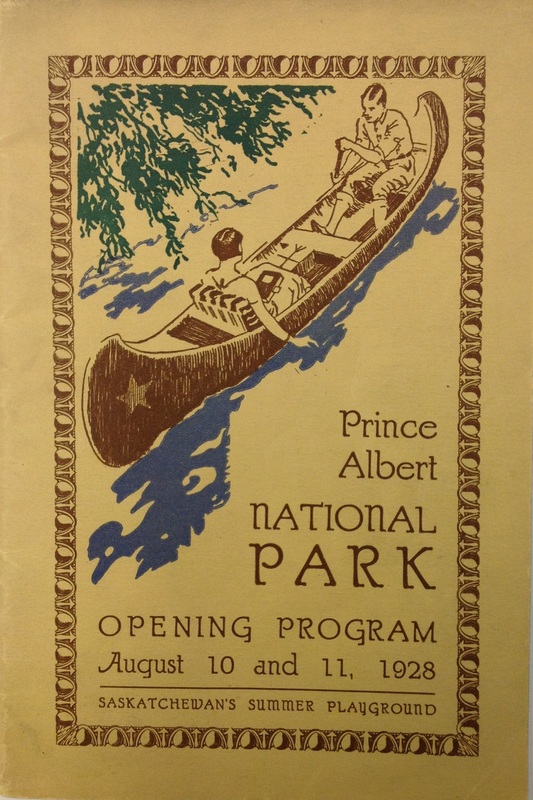 When in 1985 Canada celebrated the centennial of its national parks system, a group of retired and retiring Parks Canada employees sought to establish a collection of historical material related to parks, with the potential goal of creating a national park museum. 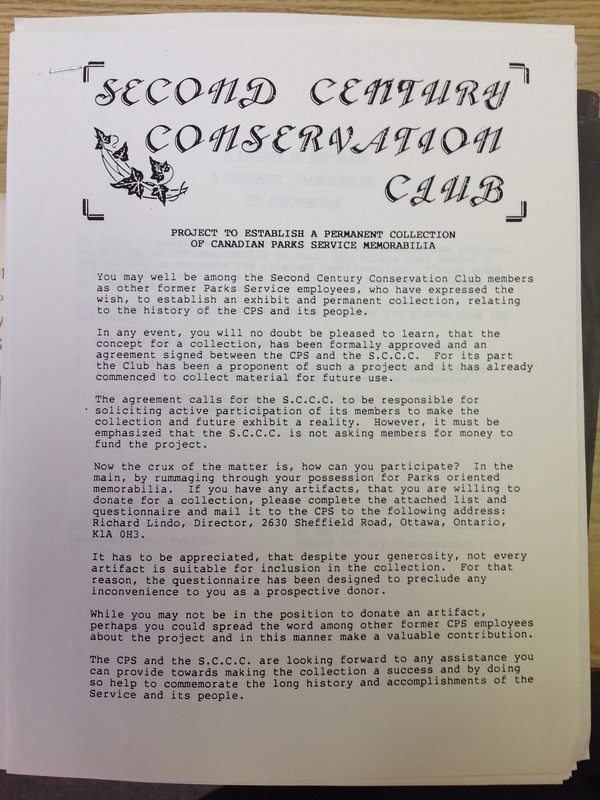 They incorporated as “The Second Century Conservation Club” (a name quickly shortened), won support from the agency, and began gathering donations of historical material. Guidebooks, official publications, and grey literature. Correspondence. Uniforms. Photographs. Signage. Notebooks and journals. Centennial memorabilia. To anyone interested in Canadian national parks and their history, a goldmine. But the museum never got off the ground and the collection eventually found its way to the Ottawa warehouse that is Parks Canada’s repository for its national collection of historic objects. To ensure the collections did not get intermixed, the Second Century Club’s was stored in the building’s walk-in safe. 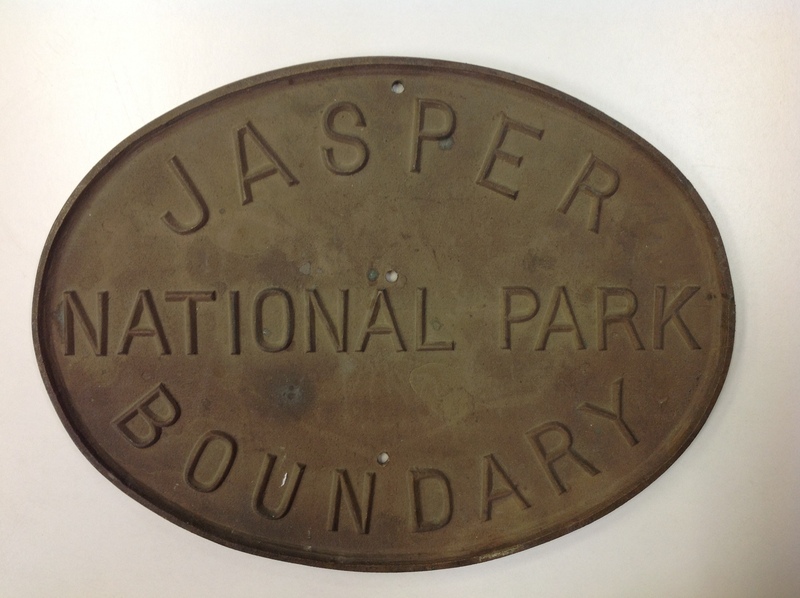 Jasper National Park boundary sign. Source: Second Century Club collection. In 2013, a casual conversation with a Parks Canada employee familiar with the Second Century Club collection provided me with an opportunity to examine it in detail. What I found was a glorious mess. A one-of-a-kind, nationally-significant gathering of ephemera, print publications, original photographs, and material artifacts linked by the shared theme of Canadian parks history. A significant portion of the contents came from the office of W.F. Lothian, the agency’s official historian in the 1980s. And yet I could understand why the collection had not yet found a secure home. There was a great deal of published material that no museum would want, a great deal of archival material that no library would ever want, and no obvious single repository for it all. Founding director of the Second Century Club Ron Malis wanted to see the collection not just preserved but, as much as possible, publicly available and put to use. I created an inventory of the collection for him, separating it into its component parts. This helped Parks Canada confirm which objects and paper ephemera it was able to accept into its own collection. And it helped Malis recognize the value to researchers in having all the publications go to a university library. The 600 publications coming to Western consist of a little bit of everything. There is a full run of annual reports from the individuals in charge of national parks, all the way back to 1885 – earlier than I had ever seen. There are one-of-a-kinds such as “A Choric Ode on the Opening of the Banff-Windermere Highway.” There are hundreds of guidebooks and pamphlets from across the country and across the century. There are acts, proceedings, master plans, and newsletters. The Second Century Club collection will be available to researchers at Western’s Archives and Research Collections Centre within the year. I also plan to digitize parts of the collection and put it online. With the surfacing of the Second Century Club collection and the recent creation of parkscanadahistory.com, Canadians will have much better access to our published park heritage than ever before. Thank you to the members of the Second Century Club for their foresight and care in accumulating the collection and to Parks Canada for helping to preserve it. A special thank you to Ron Malis and Western Archivist Robin Keirstead for giving the publications a second life at Western. I’d never heard of the Second Century Club before — is it still active? It’s too bad they never found a place to put a museum together. In British Columbia, the Elders Council for BC Parks has been fortunate to receive a dedicated space for their activities, including displays and a growing archive of material: http://www.elderscouncilforparks.org/about/ The council can be a great resource for people studying the history of parks and protected areas in BC, including provincial, regional, and municipal parks. Thanks for this, Ben. The Second Century Club is not really active, from what I can see. I’m glad that Parks Canada itself has taken ownership of the material objects that the Club collected, and I hope that the correspondence from Lothian’s office (not as historically significant as you might hope) eventually makes it to Library and Archives Canada.